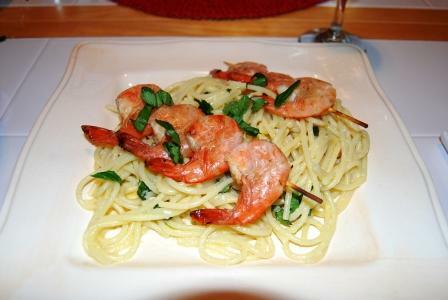 Sunday I made Grilled Shrimp with Lemon Pasta. 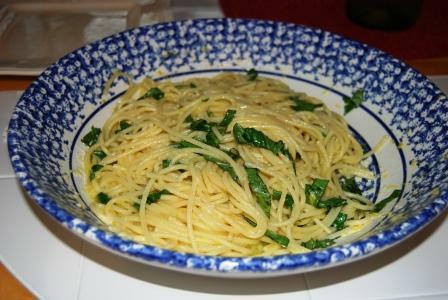 I looked around for an easy lemon pasta recipe and found Giada De Laurentis had one that was easy and looked great – check out her Lemon Spaghetti. I whisked this all in a medium bowl and then tossed in a half pound of large de-veined shrimp. Let that marinate for about an hour; then placed the shrimp on skewers that were soaked in water for about a half hour. I grilled the skewered shrimp on high on an electric grill for about three minutes each side. Only turned the skewers once. Enjoy. Write if you have questions. Note: My Eggplant Parmesan is NOT a vegetarian meal. 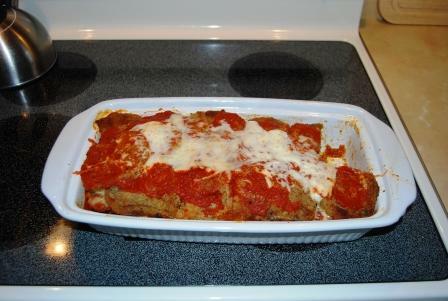 It is a wonderful blend of Italian meatballs, sausage, cheese, eggplant, and home made sauce. Left-over meatballs (4), left over Italian sausage (3), and about two cups of left over spaghetti sauce. Peel the eggplant and slice them a little more than ¼ inch thick. 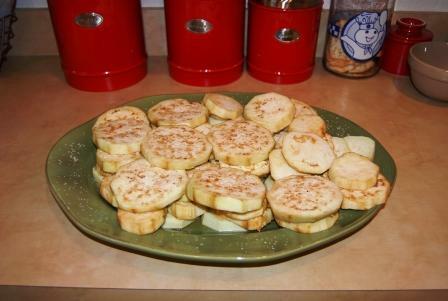 Lay the sliced eggplant out on a large platter and generously salt them with kosher salt. Layer the slice and salt them until all of them are sliced and salted. Let them set for about an hour. A lot of dark liquid will come out of the eggplant. Be sure and drain the liquid. After an hour, rinse all of the eggplant under cold running water, and then pat them all dry. In a medium bowl, beat 4 eggs with a tablespoon of water. Pour out 2 cups of seasoned bread crumbs onto a large plate. You may need to use more bread crumbs or eggs depending on the size of your eggplant. 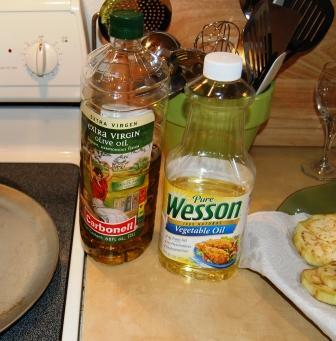 On a large sheet pan (it helps to have two pans) blend the olive oil and the vegetable oil. Dip sliced eggplant in egg and then in the bread crumbs and place on the oiled sheet pan. Do this until the sheet pan is full. If you have another pan, do the same process. Bake the eggplant until golden brown on both sides (about 10 minutes each side). 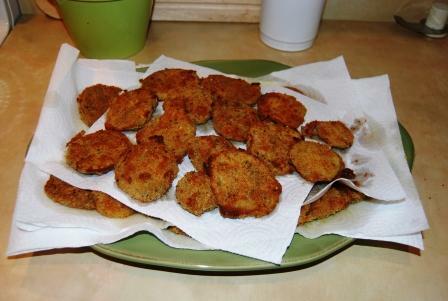 When done, lay the fried eggplant on a large platter lined with paper towel to drain the excess oil. Put paper towel between layers of eggplant to ensure proper drain. Repeat this until all of the eggplant has been fried and let them cool a bit. 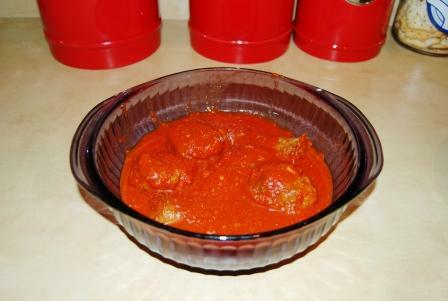 In the meantime, using a fork or potato masher, break up the meatballs and sausage with some sauce. Then add the rest of the sauce and mix. 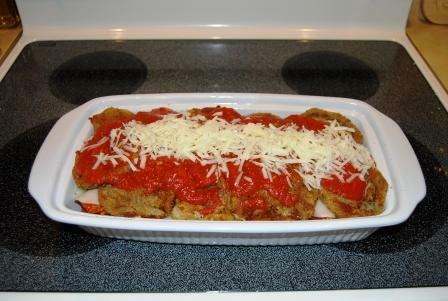 In 9 X 9 baking dish – spread some sauce on the bottom of the baking dish. Line the pan with the first layer of eggplant. Next put down three slices of provolone cheese and a little of the shredded mozzarella cheese. Next, spoon on some of the meat/sauce mixture. Repeat these steps until the baking dish is full, or you’ve used up all of the eggplant. Top with any remaining sauce and cheese. Bake –covered (I use a sheet of parchment paper covered with aluminum foil) for 1 hour at 350 degrees. My family loves to make eggplant sandwiches using Portuguese Rolls. Sometimes I will cook angel hair pasta and top with a nice square of eggplant parmesan and extra sauce. Enjoy. If you have questions, write me at dadcooks at reciperedux dot com. I made a terrific macaroni and cheese – this time I just kind of threw it together but I added a little Dijon mustard. 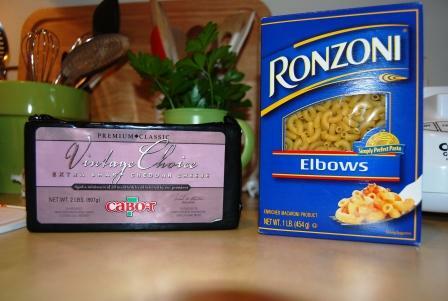 I also used two cheeses – Velveeta and Cabot Sharp White Cheddar. Preheat the oven to 350 degrees F and butter a 9×9 baking dish. Bring a large pot of salted water to a boil over high heat. Add the macaroni and cook, stirring occasionally until it is almost tender, 10 to 12 minutes. Drain, set aside and cover to keep warm. In a large saucepan, melt the butter, add the flour and stir quickly to make a paste – as soon as it forms add the milk a little bit at a time, so that it all combines without lumps. Add the salt, black pepper, nutmeg, and Dijon mustard and whisk to combine completely – simmer slowly until it makes a sauce that will evenly coat the back of a wooden spoon. Course grate the cheddar cheese and cube the Velveeta and add both to the sauce and blend completely. Add the cheese sauce to the pot of macaroni and stir until all is combined evenly – then transfer to the buttered baking dish. Smooth it out, then sprinkle the top with seasoned bread crumbs. Bake for 20 – 25 minutes or until it bubbles from the sides and the bread crumbs get a bit toasty. Serve warm. This tasted even better the next two days, heated up in the microwave for a couple of minutes. 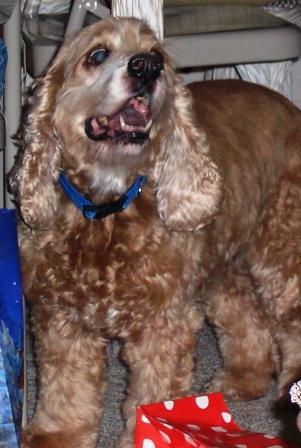 Toby, you were a great friend to us – I know you are in doggy heaven. We love you. 1/4 cup grated ParmesanPreheat the oven to 350 degrees F.Bring a large pot of salted water to a boil over high heat. Add the macaroni and cook, stirring occasionally until it is almost tender, 10 to 12 minutes. Drain, rinse with cold water, and set aside.In a large bowl, beat the eggs with the milk, 1/4 cup melted butter, the cayenne pepper, and a teaspoon of salt.Put half the macaroni into a buttered 2-quart casserole and top with half the cheddar cheese. Repeat. Pour the milk mixture over the macaroni and cheese.In a small bowl, mix the bread crumbs with the paprika, the remaining butter, and the Parmesan. Sprinkle the bread crumb mixture over the macaroni and bake until brown and bubbly, 40 to 45 minutes. Serve warm. We had company from Cincinnati last night and a big request for pizza. Since we follow the dictate of – no meat of Fridays during Lent, I made three excellent meat-less pizzas. 1. Caramelized Sweet Onion and Baby Bella mushrooms with homemade pizza sauce and provolone cheese – got rave reviews on that one. 2. Greek Pizza – with the obvious – homemade pizza sauce, pre-cooked spinach w/garlic, chopped Kalamata Olives (pitted), fried eggplant, and Feta cheese. 3. Pepper Pizza – Slivers of Red and Green Bell Peppers with rings of Cubanelle Peppers – homemade sauce, provolone cheese as well. I always dust the pizza (no matter what the toppings are) with garlic powder and dried oregano before putting them in the oven at 400 (for 25 minutes). Try these… they were a real hit last night. 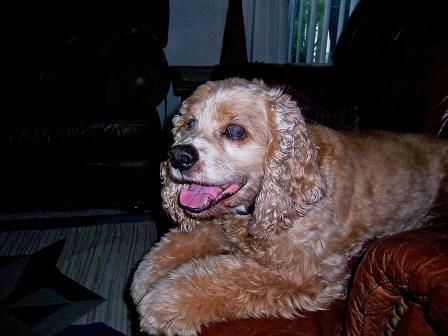 This recipe for Chicken Vesuvio came from a local restaurant in the Orlando, FL area – Pebbles. As far as I know the restaurant has closed in our area (I think there were 4 or 5 in the Orlando area) and I really liked this dish. It was published in the Orlando Sentinel as well as Restaurant Secrets of Central Florida. Hope you like it. In a large sauté pan, melt 4 tablespoons of the butter. Add capers, ½ teaspoon of the chopped garlic, lemon juice, rosemary, oregano, parsley, salt, pepper and tobasco; stir to make Vesuvio butter. Add chicken strips to pan and sauté over medium heat until browned on both sides. Add remaining 2 teaspoons chopped garlic, demi-glaze, wine and lemon juice; let mixture cook until reduced in volume by one-third. Whisk in remaining 4 tablespoons butter. Remove pan from heat; stir in egg yolks and continue stirring until sauce thickens. Add hot pasta and plum tomatoes. Turn pasta out onto a platter. Garnish with parsley, snow peas and red pepper if desired. Top with grated cheese. Makes two servings. Serve with your favorite Chardonnay.